This is part 2 (ref part 1) of a two part blog series about EMI / RFI gaskets offered by Stockwell Elastomerics. Most EMI gaskets manufactured by Stockwell serve several functions; the first is to shield EMI emissions, the second is to protect a device from being interfered with by external emission (often referred to as susceptibility). Lastly, Stockwell EMI gaskets also perform the dual function of environmental sealing, protecting electronics from water damage from splashing, washing or rain. How is silicone rubber conductive? The short answer is – it’s not. Silicone rubber, the polymer of choice for most conductive rubber products, is not inherently conductive however the raw compound can be densely mixed with very fine conductive particles. Since they are so densely mixed, the powder-like particles create an electrical path through the rubber. The silicone rubber still maintains its elastomeric properties allowing it to be compressed. There is some trade off with tensile strength due to the fill, but this is typically not a concern since EMI gaskets are used in a compressed state. How are particle filled EMI gaskets made? Stockwell Elastomerics manufactures conductive filled EMI gaskets by either compression molding the gasket directly or by cutting parts from pre-manufactured sheets. 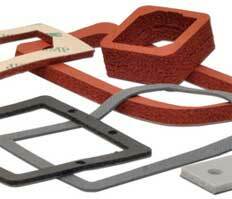 Molding EMI gaskets – best selected for volumes justifying a mold investment. Very often the payback is quick if there is material saving over die cut parts. Molding EMI gaskets allows for 3D features such as sealing beads that can reduce the clamp pressure needed to make a seal. In general, conductive adhesive backings are not available (with some exceptions). Waterjet cut or die cut EMI gaskets – cutting pre-formed sheets or rolls of material allows Stockwell to quickly manufacture custom EMI gaskets. EMI gasket sheets are readily available with or without 3M conductive PSA backings. 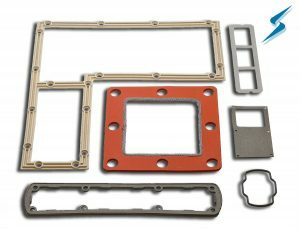 Waterjet cut EMI gaskets are often preferred for optimizing yield and responsive manufacturing. Stockwell Elastomerics offers several EMI gasket materials, most often the delineation is between commercial applications and military applications. Some military applications require material to meet MIL-DTL-83528, this specification concisely defines the base polymer (silicone or fluorosilicone) and the specific conductive fill, silver coated aluminum is the most common. Commercial and military applications not requiring MIL-DTL-83528 often use nickel coated graphite particles as the conductive fill. Nickel graphite is significantly lower cost than silver/aluminum with very good shielding properties. Below are Stockwell Elastomerics materials commonly specified for EMI application. Stockwell Elastomerics is a U.S.A. EMI gasket manufacturer supplying custom EMI gaskets globally to OEMs. With a core competence in silicone and a responsive manufacturing model; Stockwell Elastomerics offers many material and processing options to meet most EMI gasketing requirements.